As always we are always striving to make atvans.org the best that it can possibly be. We believe that we have some of the best trails and scenery in the world and we want to show it off to everyone that visits our website. That being said, we are looking to our ATVing community to help us show off our province. We need your photos for our website. - Scenic horizontal photos that we can use on our atvans.org website. - The photos need to feature Nova Scotia. - Ideally the photo will have at least 1 ATV or Side by Side (SxS) in it, but the photos don't necessarily have to contain ATVs or SxS. 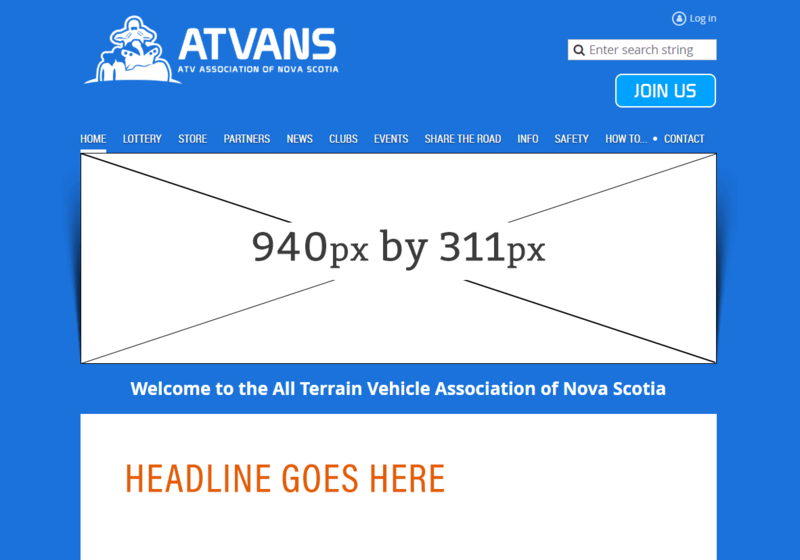 - You must own (have taken) the picture yourself and consent to ATVANS using your photo for our website. - Photos that comply with all OHV rules. - Riding in non-authorized areas. - Riding in sensitive areas. - Photos including consumption of alcohol or marijuana. For reference, below is an image showing the size and layout of where your picture could be used. NOTE: Because of sizing and other various reasons we may not be able to use your photo.